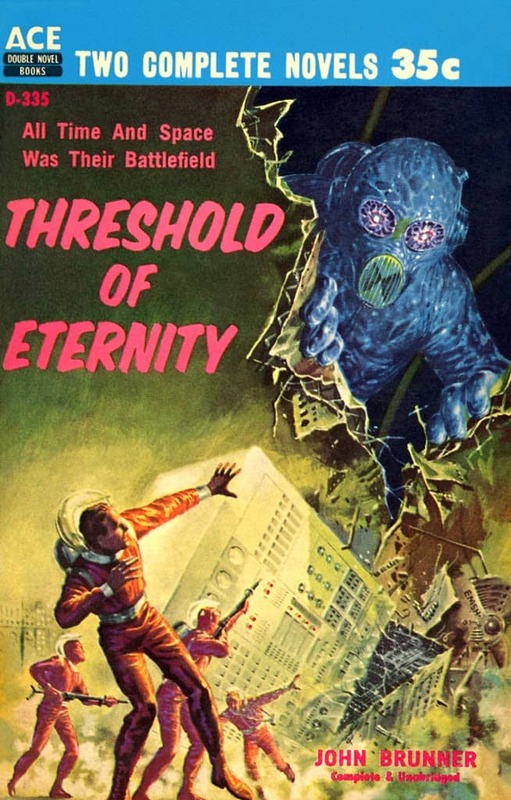 These novels both come very early in their authors’ careers… Threshold of Eternity was first published in New Worlds, December 1957 through February 1958. 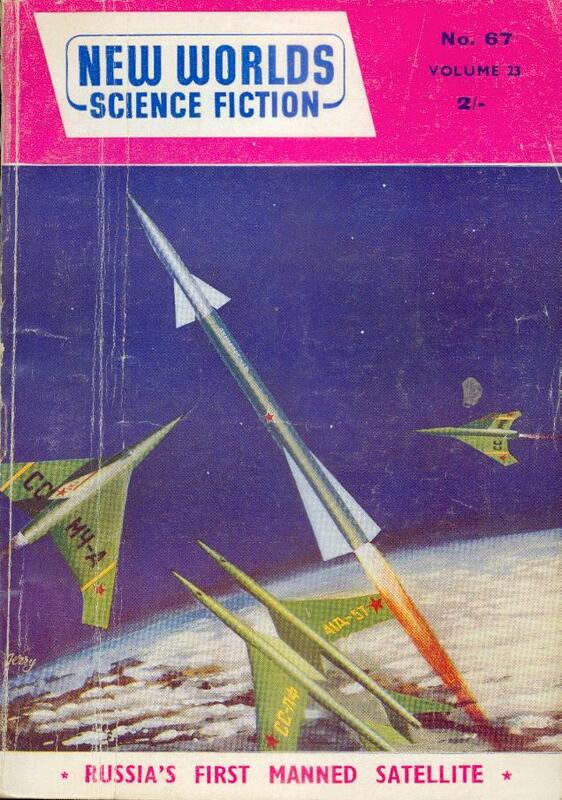 I don’t know if that serialization was the same as the 1959 Ace Double edition, though I suspect it was pretty similar. It’s just about 50,000 words long. 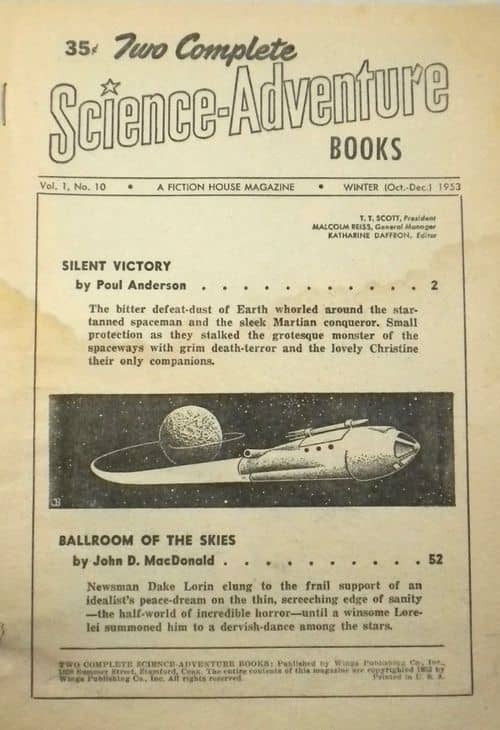 The War of Two Worlds was first published in Two Complete Science-Adventure Books for Winter 1953 as “Silent Victory.” That version seems to be substantially the same as the Ace Double … both are in the neighborhood of 35,000 words. New Worlds is a magazine I don’t see very often on this side of the Atlantic — in fact, I’m not sure I have any copies at all. Back issues are pricey, too, which means I usually spend my weekly magazine dollars on another cheap batch of Galaxy on eBay, instead of that occasionally enticing New Worlds lot. 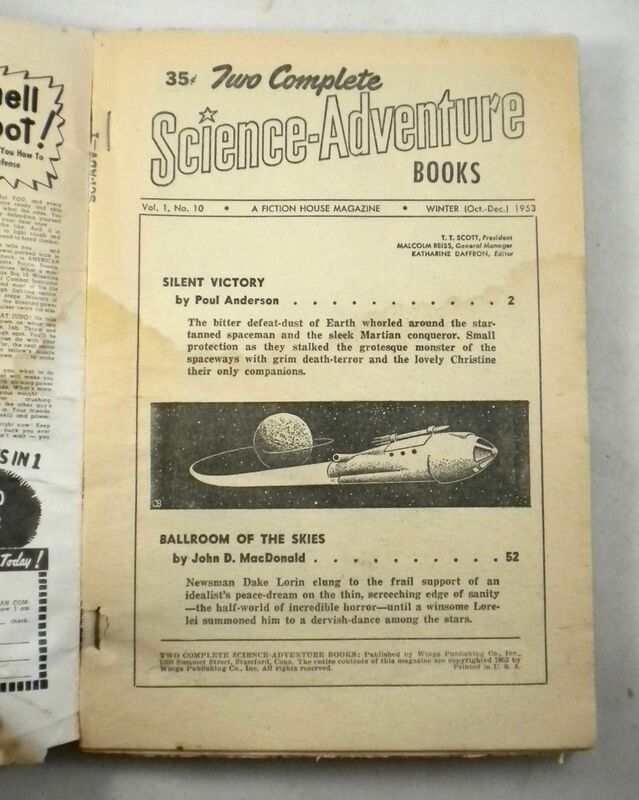 Here’s the three issues from 1957-58 Rich mentioned above. Here’s Rich on the Brunner half of D-335. Threshold of Eternity… opens in California in 1957 or so, as one-legged Red Hawkins encounters a French-speaking girl who couldn’t possibly be there — and, indeed, it turns out that Chantal Vareze was just in London. What’s stranger is the other person they soon encounter, a man named Burma who turns out to be from thousands of years in the future. We jump, then, to the future, where Magwareet is helping to coordinate humanity’s desperate war against mysterious aliens called The Enemy. One of the side effects of their battles, and also of a strange entity called The Being, is temporal surges, which can throw people into the far past. And Magwareet has just realized that his friend Burma has been flung into the past, to the distress of Burma’s wife, Artesha, who we soon realize is embodied in the computers that control human society. Meanwhile a sort of “city in flight” (a la James Blish) has been encountered, infested with one of the Enemy, who becomes the first humans can capture alive. I had no idea the Brunner/Broderick posthumous collaboration existed but, sure enough, a little digging turned it up. 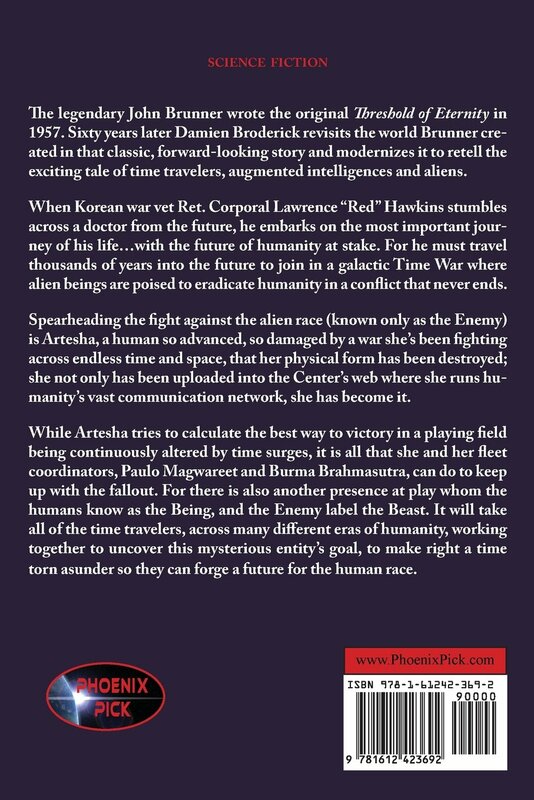 It was published in trade paperback by Phoenix Pick in November of last year; the new edition is 233 pages, priced at $14.99 in trade paperback and $3.99 for the digital edition. 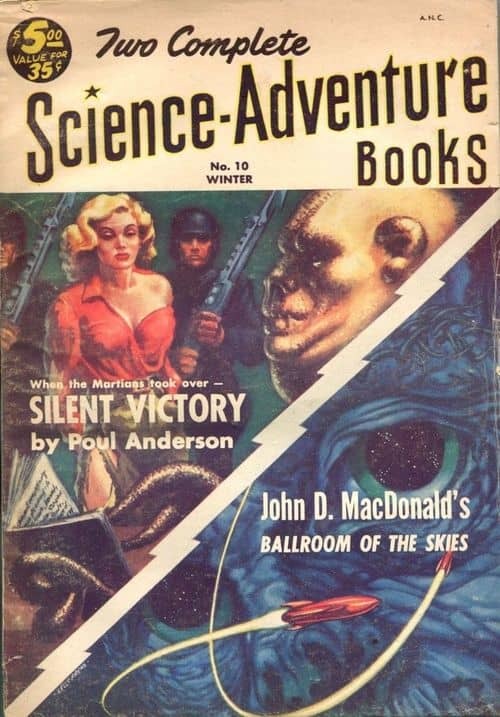 As Rich noted, Poul Anderson’s The War of Two Worlds first appeared in the 10th issue (December 1953) of Two Complete Science-Adventure Books, one of the last pulp-format SF magazines, under the title “Silent Victory.” It was published alongside John D. MacDonald’s “Ballroom of the Skies.” This one is a little easier to find than those elusive New Worlds we just talked about. Here’s a look at the complete TOC for the issue, mostly because I cherish those breathless 1-paragraph story summaries. Here’s Rich on the Anderson. 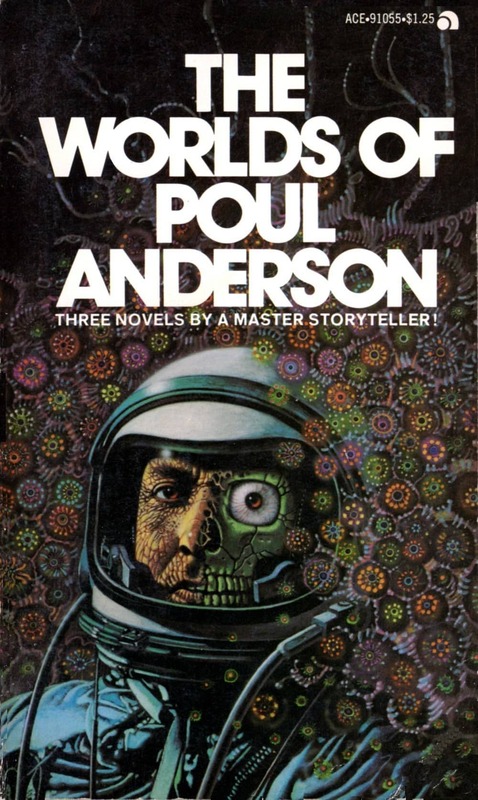 Poul Anderson’s The War of Two Worlds… opens with Intelligence Prime, now the alien ruler of the Solar System, receiving a manuscript written by David Arnfeld, who had discovered the aliens and tried to start a resistance, before being betrayed by his companion Christine Hawkins, in order to save her young child. The rest of the book is Arnfeld’s manuscript, which opens as he, once part of Earth’s Space Navy, returns to a defeated Earth after a bitter and useless war with Mars, that Earth lost. Arnfeld makes his way to upstate New York and his old farm, along the way acquiring Christine Hawkins and her young daughter. Once at his farm he is disgusted to learn that he will be forced to accomodate a Martian garrison, commanded by Sevni Regelin dzu Corothan. Inevitably, if slowly, he comes to realize that Regelin is as honorable a creature as he hopes he is himself, and they reluctantly become sort of friends, despite Kit Hawkins’ hostility. (It will not surprise the reader that Kit and David are falling for each other.) 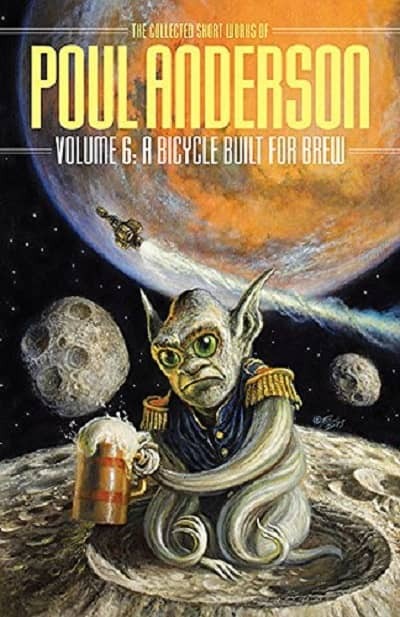 David soon realizes that Regelin is just as disgusted and confused by the war between Earth and Mars, and by its incompetent conduct, as he is. And then they have visitors — a senior Martian and his human Quisling. And by accident, David electrocutes one of them, and it shapeshifts — it is an alien! We can see right away what has happened — the Solar System has been invaded by shapeshifting aliens, who took the form of leaders of both Earth and Mars, in order to force them into a foolish and destructive war, after which they can take over both planets. David, Kit, and “Reggie” begin a desperate attempt to raise awareness that the Martian leaders and their human collaborators are infested with shapeshifters … but how can they succeed, when any of those they encounter might be aliens themselves? Read Rich’s complete review at Strange at Ecbatan here. 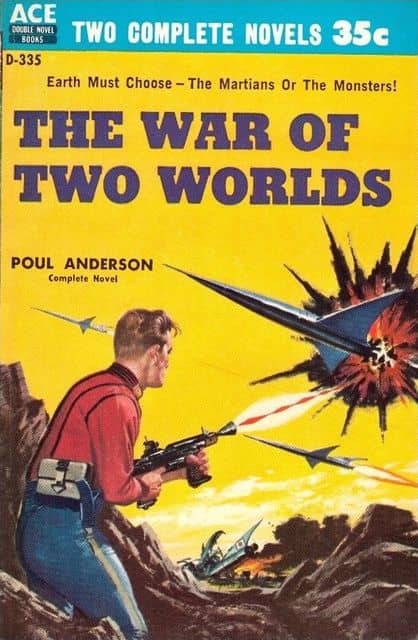 The War of Two Worlds was reprinted as one of three novellas in The Worlds of Poul Anderson, a 1974 paperback from Ace Books with an eye-popping wraparound cover by Joseph Lombardero. Threshold of Eternity by John Brunner and The War of Two Worlds by Poul Anderson were published by Ace Books as Ace Double 335 in January 1959. It is 148 + 108 pages, priced at 35 cents. 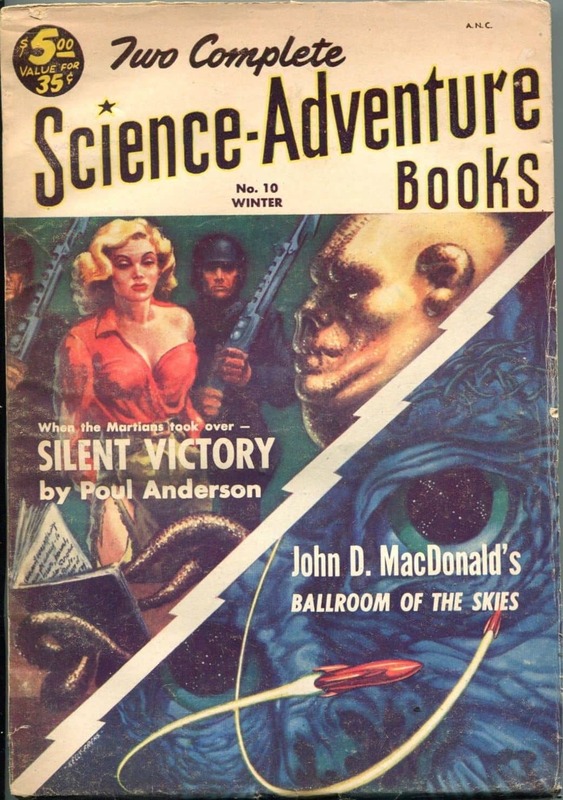 The eye-catching covers are by Ed Emshwiller and Ed Valigursky. This is a double I own but haven’t read. 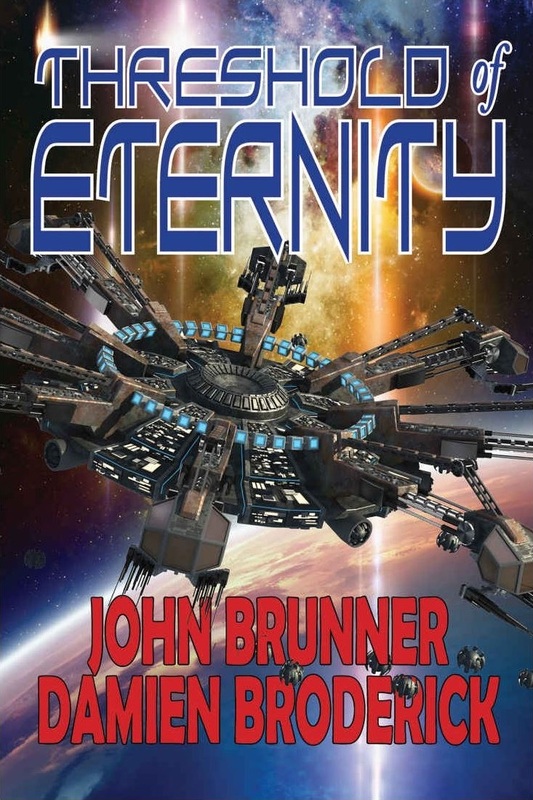 But the Brunner side – that cover! THAT COVER! An all-time classic. Thomas — I couldn’t agree more. I can put up with a lot of “1930s superscientific guff” if it comes with giant monsters from another dimension. I plan to do a review of Damien’s version Real Soon Now (basically, after I’m done catching up on Hugo reading). 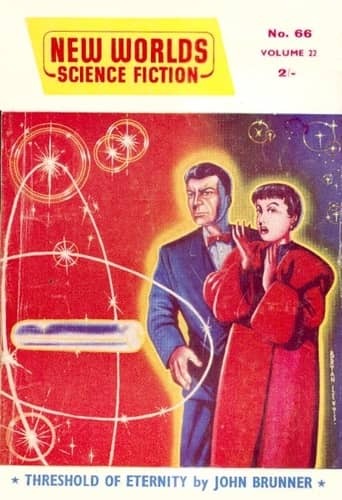 As for that Emsh cover for the Brunner novel, I just wonder what Carol said when Ed told her to get dressed in that wild suit to serve as a model for the giant monster from another dimension! Glad you appreciate the effort we put into scanning high-resolution images of pristine books. That’s a matter of pride at Black Gate. 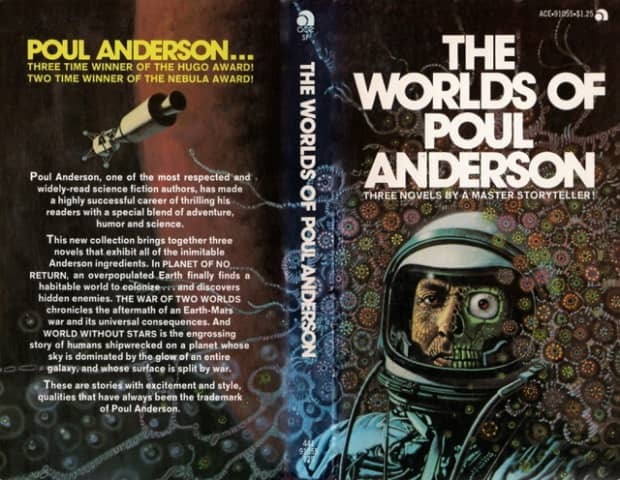 I do find it annoying when other sites showcase the fantastic artwork on some of these old covers, and do it with tattered paperbacks in terrible shape! 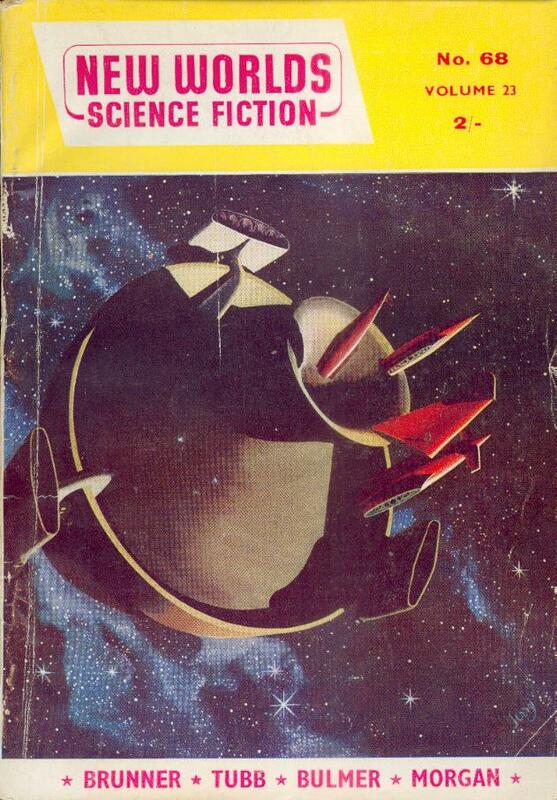 I try to preserve the vintage paperbacks I collect, and am always on the lookout for copies in even better condition. People often ask how I track down so many flawless copies of books I choose to feature as Vintage Treasures, when it’s often the other way around… when I find a book in terrific shape, I usually feature it as a Vintage Treasure. I can’t take credit for every image on the site, though. There are a few excellent resources to help you find high-res images out there, including the TinEye Image Search engine, eBay, and a few others. Glad you enjoy them! Ah, excellent! Looking forward to it. Great question… I wonder if we can find any pics from the modeling shoot!